Putting their 'ears to the wall' of the International Space Station to assess the sounds emitted, and whether a machine needs to be repaired or replaced is a task that these two companies have undertaken. 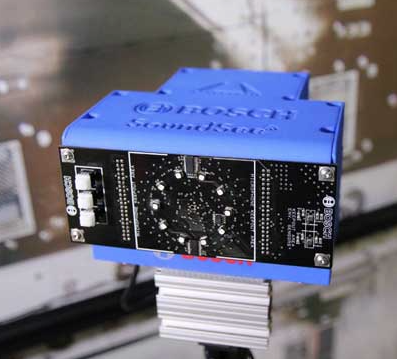 Bosch in North America and Astrobotic Technology Inc. are partnering in their research to send experimental sensor technology to the International Space Station (ISS) as early as May 2019 using Bosch’s SoundSee deep audio analytics capability with a custom array of microphones and machine learning to analyze information contained in emitted noises. SoundSee’s analytics will investigate whether audio data from equipment could be learned and understood using advanced software, such that it could be used to improve the operations of the ISS. The SoundSee payload will ride on NASA’s Astrobee Robot, an autonomous free-flying vehicle capable of navigating throughout the ISS. The NASA Ames Research Center’s Astrobee team has also provided support for ground testing. Dr. Samarjit Das, principal researcher at Bosch Research and Technology Center in Pittsburgh said that machines, such as motors and pumps, emit noise signatures while they operate. The SoundSee AI (artificial intelligence) algorithm uses machine learning to analyze these subtle acoustic clues and determine whether a machine, or even a single component of a machine, needs to be repaired or replaced. Dr. Andrew Horchler, Astrobotic lead project engineer added that the support from NASA has been critical. They have provided feedback and requirements that have helped us design our operational plans and understand the challenges of sending a hardware payload to the ISS. On the ISS, researchers will collect data and send it to Earth for Bosch to study. As research progresses, the team expects to update the software or adjust operational routines to improve data-collection results. Jon Macoskey, research engineer at Bosch and lead payload designer for the project stated that this data should allow them to gain insights into the state of the space station. Their long-term goal is to show that they can detect anomalies in the operation of the station and return that intelligence to crewmembers or ground control. The research has promise for numerous terrestrial applications and other crewed spacecraft, including missions to the Moon and Mars. Dr. Joseph Szurley, a Bosch research scientist on the project commented that for some time, Bosch has been interested in using audio analytics to monitor critical machines and equipment, such as car engines or HVAC systems. The ISS will allow them to study how these techniques can extend to even more challenging and unique environments. Astrobotic’s Future Missions and Technology team, a space robotics research group, is developing the flight version of the sensor, known as the SoundSee payload. The team will also lead ground testing and preparation for flight. Fraser Kitchell, director of Astrobotic Future Missions and Technology stated that conducting research in space, even when you have an asset like the ISS, is significantly more challenging than testing on the ground. As a space robotics company, they are able to help Bosch prepare for operating in this highly controlled space environment. Foale concluded that since meeting the team at Astrobotic in Pittsburgh for the SoundSee preliminary design review, he is convinced that this novel, cutting-edge approach to using machine learning in space will not only have great benefits for troubleshooting ISS problems, but especially throughout industry on Earth. Bosch’s Das said Commander Foale has provided invaluable operational insights into how the mission might operate within the ISS and helped us complete our preliminary design review this summer. Bosch's test facility at Astrobotic is helping them validate the techniques that they will deploy on the ISS. Kitchell said they have a dedicated team and clear path to flight. They couldn’t be more excited to work with Bosch, NASA and CASIS on this critical work.